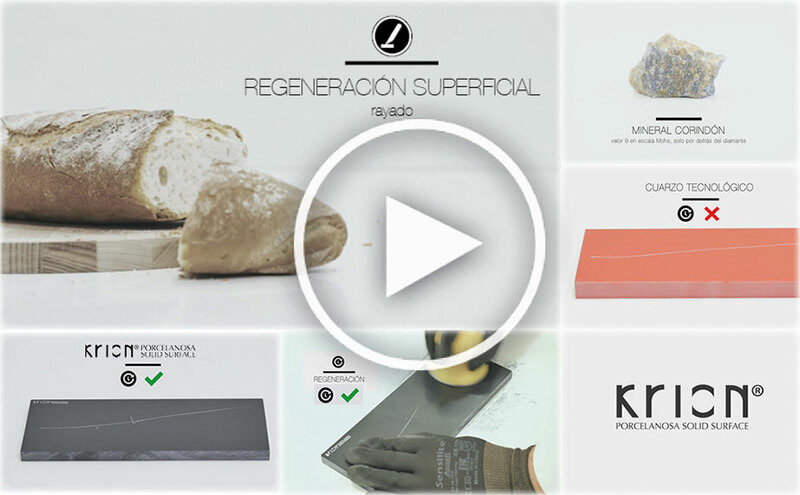 Continuing with the VIDEO TRIALS section, today we would like to present one of the aspects that characterises KRION® and differentiates it from the majority of materials on the market: surface regeneration, in this case against scratches. “Surface Regeneration – Scratches” The answer to the question, “can the solid surface from PORCELANOSA Group, KRION®, be scratched?” is short and simple. Yes, it can be scratched like other materials, but with the difference of it being possible to regenerate the material, leaving it in its original state. We must note that each colour of the KRION® range behaves in a different manner when scratched. In our catalogues and on our website we can see the colours according to recommended use, taking into account that all colours are suitable for any use. At KRION® we recommend use according to the following criteria.